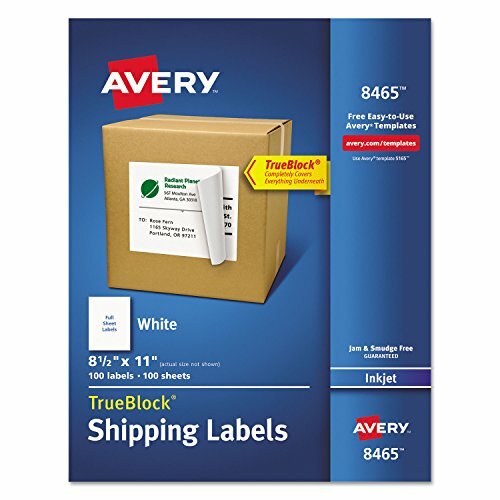 Create customized labels quickly and easily with these Shipping Labels featuring TrueBlock technology. These are great for shipping and mailing, as well as for creating craft labels, gift tags and more. With our TrueBlock technology you can cover up everything underneath the label, letting you reuse boxes, while offering a bright professional appearance. Optimized for inkjet printers, it's easy to personalize your labels with logos, graphics or images using the free printable templates and designs at avery.com/templates. 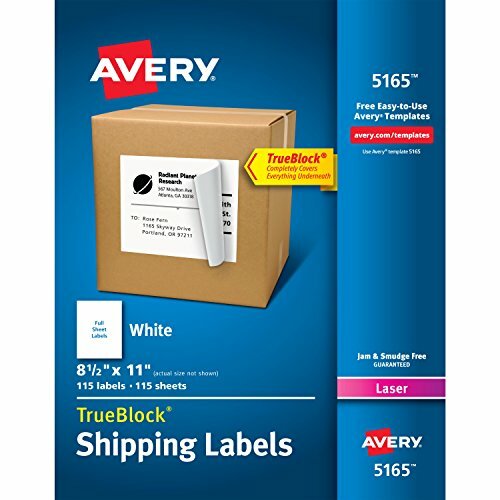 Quickly and easily create your own customized large printable labels with these Avery shipping labels featuring TrueBlock Technology. This bulk pack is great for high-volume shipping and mailing jobs, as well as for gift tags, arts & crafts, party favors, address labels and organization and ID labels. Package includes 115 printable full sheet labels with permanent adhesive. With our TrueBlock Technology you can cover up everything underneath the label, concealing existing markings while maintaining whiteness and brightness. This enables you to reuse boxes, creating less waste and saving money while offering a bright professional appearance at the same time! 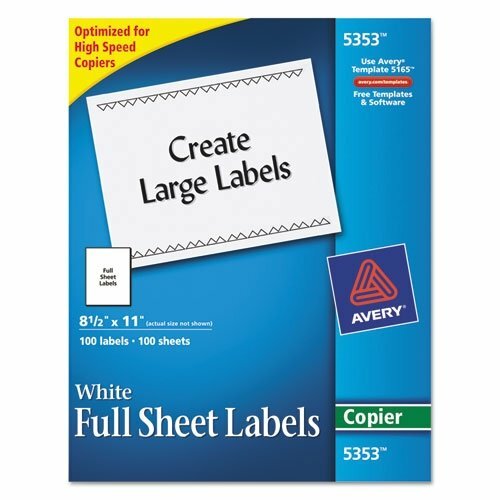 Optimized for laser printers, it's easy to personalize your labels with logos, graphics or images using the free printable templates and designs templates at avery.com/templates. Compatible with most popular shipping software. Make your packages stand out. SMUDGE-FREE and JAM-FREE adhesive ensures perfect labels every time. Rectangle labels are also great for use as storage container labels and bin labels. 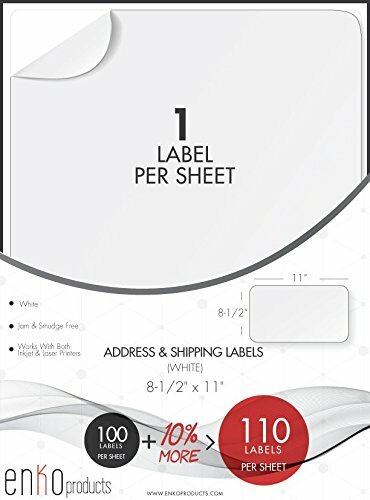 1 label per sheet, 8.5" x 11". Easily create labels with a professional, printed-on look using these Clear Full-Sheet Shipping Labels. Perfect for shipping, addressing, signage, special occasions and more, the labels virtually disappear on white, light-colored and textured surfaces. 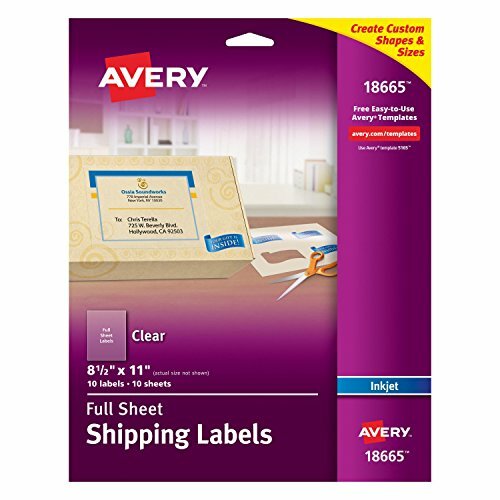 The labels are compatible with inkjet printers and they're simple to customize with sharp, clear text using free templates and designs at avery.com/templates. 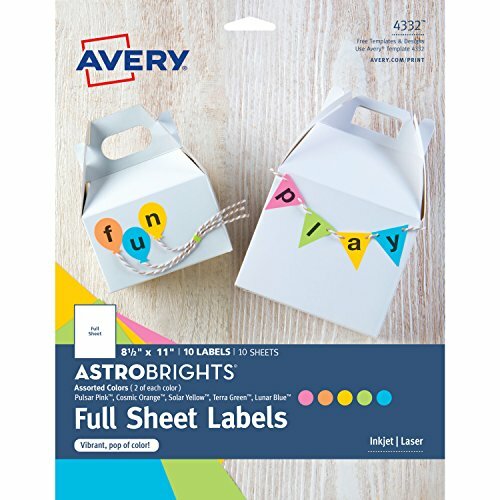 The bright, vivid colors of these Astrobrights Color Full-Sheet Labels offer a vibrant pop to arts and crafts, party decorations, branding and pricing. Easily create custom sizes and shapes using scissors or your favorite cutting machine. The labels are easy to customize using our free designs and templates at avery/print and a laser or inkjet printer. Just personalize, print and stick. For best printer results, make sure to feed just one sheet at a time. Please note: These labels are not water resistant, and colors will bleed when wet. This product uses Astrobrights paper manufactured by Neenah Paper, Inc. The Astrobrights registered mark and related color names Pulsar Pink, Cosmic Orange, Solar Yellow, Terra Green and Lunar Blue are trademarks of Neenah. 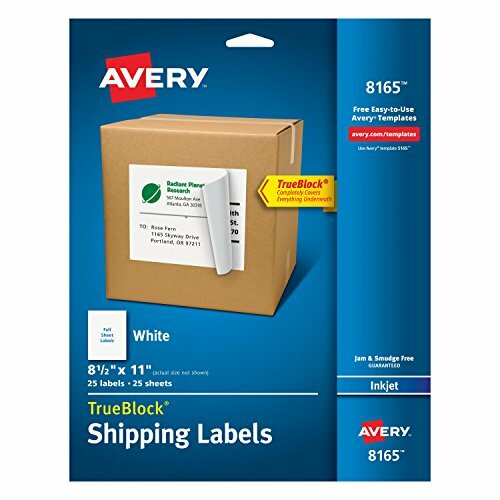 It's quick and easy to print your own customized labels with these Shipping Labels featuring TrueBlock technology. Great for shipping and mailing, as well as for homemade gifts, crafts and more. With our TrueBlock technology you can cover up everything underneath the label, letting you reuse boxes, while offering a bright professional appearance. Optimized for laser printers, it's easy to personalize your labels with logos, graphics or images using the free printable templates and designs at avery.com/templates. Make sure your packages get where they're supposed to go without any confusing markings showing through when you use these bright white shipping labels. TrueBlock Technology completely covers everything underneath. UltraholdTM Adhesive sticks to more tough surfaces, ensuring your label doesn't fall off your package. It's easy to create custom labels with logos, barcodes and more using free templates and designs from Avery Design & Print. Just print your labels right from your own printer. It's easier than ever to get the job done right. This product was made from wood that came from a certified managed forest. Compare prices on Full Sheet Avery Labels at ShoppinGent.com – use promo codes and coupons for best offers and deals. Start smart buying with ShoppinGent.com right now and choose your golden price on every purchase.